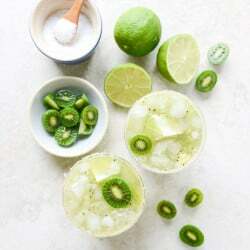 Just saw kiwis in the store the other and couldn’t decide what to make with them, I guess I’ll just have to drink them ;) Sounds delicious and refreshing!! Kiwi are always in abundance in Australia! Mostly they are used as it is or on top a fluffy pav however the the way the little seeds sparkle in this light green drink. It is almost like magic! Bring on the booze! Can you include some party-friendly food in your upcoming lineup?? I have a menu to plan for our boxing match/cinco de mayo party (what?). So far I have avocados on the list. Yeah. I need heeeeellllllpppp! I remember hating kiwis … it was a texture thing, I’m sure. Now, I can’t get enough of them — especially with how sweet they are this year!! OMG those kiwis berries are killing me! So cute! My fridge is literally loaded right now with overripe kiwis and I’m pretty sure that’s destiny whispering in my ear that I HAVE to make these green beauties this weekend. Totally flipping over the gorgeous green color! Oh my gosh I actually had a conversation with someone about ask jeeves just the other day! How instead of entering keywords for a search you actually typed in a question. Anywho, I must now hunt down these kiwi berries, but if nothing else I will have to settle for regular ones cause this sounds wonderful. Yeahhhh….these are happening! Love the photos, especially that back lit one! What a neat idea! I’ve had my fair share of margs but never with kiwi–yum! Oh my goodness, this looks SO good!!! I’m now mad at my Whole Foods for not carrying kiwi berries. I, also, refuse to eat kiwi skin. I’ve tried out of laziness and it literally tastes like you’re eating furry sand paper or something. Not cool. On a non-creepy note, I totally wish I could see your search history on Ask Jeeves! I have a feeling it would be hilarious. Definitely the most fun way to eat green indeed! What a pretty drink! kiwi berries!!! forgot about these guys. and urghhh i am not down with fuzz either. i was in utter disbelief when i heard people eat the kiwi skin sometimes. i can’t even handle peach skins. You had me at margarita…. I love kiwi! I must find those kiwi berries ASAP! 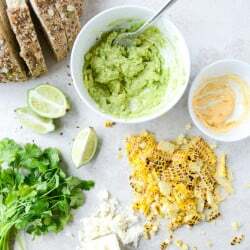 I would take this over a green smoothie any day :) so making this after we get back from Mexico! I want all the Kiwi Margaritas! Thanks for sharing!! Except I completely OD’d on kiwi and grapefruit (blasphemous, I know) to the point of shredding my palate. I actually love kiwi seeds, that little crunch! And there will no eating kiwi fuzz; ugh; I can not believe people do that. Wow! This is what I’m talking about when it comes to green juice. Screw Jamba! Lol You’ve inspired me to get a little more creative with my cocktails, as I tend to stick with the classics — Old Fashioned, Martini & Manhattan. Btw, you really threw me back with that Ask Jeeves joke. Yep, I totally used Ask Jeeves in my college years. How times change right? Those were the Napster days too. This is ALMOST too pretty to drink, it’s such a pretty green. I also really have to try the kiwi cucumber gin fizz, sounds fantastic. Yes please on the nachos. You can never have enough nacho recipes in your back pocket. I saw kiwi berries at the Whole Foods in my neck of the woods last weekend. They were so adorable but I mustered up all the will power I had and left them sitting there. Poor little berries. Now I have a reason to load them up into my cart. Holy yum, these look fan-freaking-tastic! Kiwi margs? I die. Twice. These look amazing!! I have been on the hunt for those little kiwi berries but I can’t find them anywhere! I cannot handle that creepy kiwi fuzz either so they are right up my alley! ARE YOU TRYING TO KILL ME?!?!? I looooooove fruity margaritas (and regular ones) but I never thought of doing a kiwi one ….. YOU’RE A GENIUS AND I LOVE YOU. I need to make this happen over the weekend. Oh wow! More reason to drink green. This looks so refreshing and tasty. I can’t wait to make these for my girlfriends on our next ladies night! Kiwis are so underrated and under-utilized. I love you for this. THE KIWI BERRIES! So perfect. These photos are gorgeous and I want one (three?) of these even though I’m really cold right now. You found kiwi berries in the Spring?! And you’re making Margarita’s with them?!?! If I didn’t love you already, I certainly do now. Kiwi Berries remind me of juicy fruit. Thanks, now I need to find them. I’m on a quest. This is DEFINITELY my kind of green juice too. And um hello, ask jeeves was my jam. I askied him EVERYTHING. Can’t wait to try these out!! This looks seriously delicious!!!! Gahh!!! I can’t even imagine how much fun it would be to share all these drinks with all my imaginary internet friends. Let’s hang out at the beach and work our way through an entire jar of kiwi syrup. It’s hot in my house, and I need this! Genius!